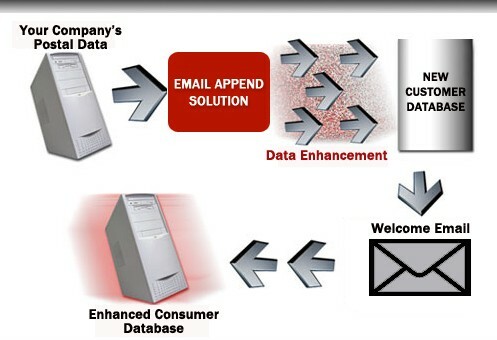 Email appending is an incredibly effective tactic for businesses looking to increase their database of email contacts. It involves matching a company’s existing database with email databases controlled by third-party email marketing companies to fill in the gaps where a company has contact information for a person but does not have their email address. A leading company such as eTargetMedia can have a success rate of 15 to 35 percent in their email appending services. They have received explicit permission from a consumer to be added to a database. There is an existing online or offline business relationship with the consumer. The consumer received notice that they would receive third-party email offers and did not opt out. Reasonable effort has been made to match the consumer’s contact record with their email address. The DMA further recommends that marketers refrain from selling, renting or trading a customer’s appended email address unless the customer has given their permission first. The organization also recommends that marketers give customers whose email contacts have been appended the option to opt out of email communications. It’s a good best practice to reach out to email contacts received through appending and ask for their permission before sending them any email marketing campaigns. Companies also need to have a method of tracking permissions and opt outs. eTargetMedia specializes in helping companies of various sizes develop highly effective email marketing campaigns. They have a database of more than 150 million email contacts that can be targeted to various demographics.